Watch and wait is a warning, that Jesus gives in the Gospel. The word watch is the alert. The Master will return in the night. Night is a time to rest and test temptation. To watch, keep awake to be vigilant and watchful. Is. 63.17,64; 1,3. St. Paul says waiting for the Master return is applied for Jesus to be revealed to the Corinthians. God is faithful to do what he has promised to keep the believers strong until the day of the Lord. Ps. 80;1,2: The man you have chosen takes a deeper meaning for Christians who would certainly recognizes in Jesus not only God's chosen one, but also the Good Shepered and the true vine. as we pray the pslam God of Hosts, restore us, make your face shown to us so that we may be saved. (Jn. 10.16) and compared himself to single vine, whose many branches would draw sustenance and life from one precious. Watch, Christian life entails a fight stronger than we are, Jesus does not want us to dream of past or the future, but the present. Each of us has a task to do. God is watching us, to see what we are doing. To watch at, be vigilant, in time of hardship and sorrow, have hope even in the dark, to hold on, even when everything crumbles down. We are like those who know that the master will come but not know when, if day by day we have finish what we have to do and expect his coming at any moment, so that we may lit the light always and not keep for tomorrow to do what is there for today. Like the faithful servant and loving friend. At least for this coming season, lift up your voices to the Goa the almighty and praise him for his glory and what you are, than waiting to be what you want to be, don't be too late to thank your God, start now, today, before it's late. No one knows their time of end but God knows everything. Repent and turn to God and watch His works in you. Rajabima Oblate Centre for Inter-Religious Dialogue and the meeting point of the North and the South will complete 20 years of service to the people of the North Central Province and to the country next year. To mark this moment of NCP Catholic history a grand new building will be declared open in February, 2009, which will ensure the continuity of the Oblate Service. The Oblate Centre situated within the portals of Anuradhapura Sacred City, the ancient citadel of the Sinhala dynasty has become a home for people of different faiths and ethnic groups. It has turned to be the beacon of hope of the young and old and a Centre brining solace to those who suffer injustice innumerous ways in areas of socio-economic, ethnic, religious and in political sphere. The principle activities annunciated and focused in setting up of the Centre included the following: Organizing inter-religious dialogue with the Buddhists and the other religious groups in this country, Theological and personal renewal of priests and religious to up-lift Christian Family life. Assistance to lay people with regard to retreats, seminars, apostolic and personal renewal. Rev.Fr. Anslem Silva OMI, the then Provincial of the Oblates of Mary Immaculate (OMI) purchased this piece of land from the owner who was running the building as a guest house. The Oblates Fathers decided to retain the name "Rajabima", given to this once popular guest house in the heart of the Sacred City and turned it into a Centre for Inter-Religious and Inter-Cultural Dialogue and the Meeting Point for the North and the South. The Centre started to promote inter-religious dialogue with the passage of time and being conscious what is expected in the present milieu the Centre was turned it to be a Serve -Centre for those passing from North to South and the vice-versa and work towards ethnic harmony. The Members of the Missionary Oblates of Mary Immaculate who resided here from time to time true to the spirit of the Mission and Vision of the Oblate Congregation and its Founder St. Eugene de Mazenod, made the Centre a Welcome House for those priests and laymen and women looking for solace, weary and tired after giving their self to the chorus of day to day life. Rev.Fr. Modestus Fernando OMI was the first to have resided at the Oblate Centre. He was the Director of the Centre from 1989 to 1990 in a way the pioneer priest laid the foundation for the future work of the Oblate Fathers entering to the North Central Province to be of service to humanity. Getting his obedience to the North Central Province he went to live there in a different milieu. His being there was looked with suspicion at the beginning as it was a novel experience to the people around and to those visitors who patronise this place as once it was a guest house. The modus operandi of Fr. Modestus drew away the suspicion and people in and around came into contact with him and him with the people living around. That sealed the understanding and recognition which paved the way to open the future Centre for Inter-Religious Dialogue, a Meeting Point of the North and South, and a Service Centre for the people of all walks of life. Fr. Modestus said: "Our Mission was to serve the people of God. The apostolic service we envisaged at the inception of the Oblate Centre had the plans to promote inter-religious harmony, prepare future catechists for the Diocese, and hold seminars and workshops for youth to empower them. We organized a *Puravesi Committee* , to give them the necessary knowledge, courage and strength to face the challenges brewing at the troubled times. We also conducted English language classes for the benefit of children and youth of the area. I am glad to learn that some of those who followed our English classes recall our services with gratitude". In 1991 Rev.Fr. Claude Perera OMI moved into the Rajabima Oblate Centre. He continued the mission initiated by his predecessor. Rev. Fr. Hilary Silva OMI worked for some time at the Centre assisted by Rev.Vro.Thomas Fernando OMI. Rev.Fr. Hermon Paul Fernando OMI who was a resident priest at the Centre for ten years while serving as a Lecturer at the Rajarata University said, that spare time available was used to provide English classes to those seeking entrance to university. "I was residing there for ten years and I being a lecturer at the University my time was spent on teaching. But we plan out programs to make the Centre a venue for student waiting to enter university to enhance their English knowledge. It has been very wonderful years and we are glad that students had benefited from our effort and service". Very Rev. Fr. Clement Waidyasekera OMI, the Provincial of the Oblates of the Colombo Province told the "*Christian Perspectives*" that the new building at Rajabima Oblate Centre would have fully furnished Ten single rooms (rooms big enough to accommodate 20 persons at a time) will be a transit point for priest and religious. There will be a Conference Hall to which also could be used for lectures, seminars and workshops conducted by religious, and inter-religious and inter-cultural groups. Fr. 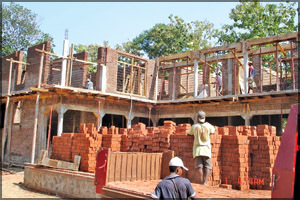 Waidyasekera added that the Centre would continue with people based projects that have been coming down during past two decades and consider allowing the use of the building for projects beneficial to people in so far as such projects go along with the mission and vision of the Oblates. 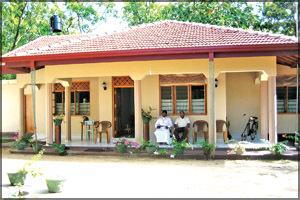 Rajabima Oblate Centre is now being administered by Rev.Fr. Dudley Saparamadu OMI with the assistance of. Rev.Fr. Michael Silva OMI. Caritas Sri Lanka - SEDEC, one of the oldest Catholic organisations in Sri Lanka has provided a beacon of hope for thousands of people. This year it celebrates its 40th Anniversary marking its commitment to the service of humanity. For 40 years Caritas Sri Lanka's work has been constantly influenced and driven by the ethos of the Christian values and beliefs. It has been recognised as a leading faith based humanitarian organisation in Sri Lanka. The organisation is based on the social teachings of the Catholic Church, which focus on the dignity of the human person. 40 years ago, SEDEC ( social and economic development centre ) took root in the mind of a visionary priest, Rev. Fr. Joe Fernando under the guidance and jurisdiction of His Eminence Thomas Cardinal Cooray. Since then Caritas Sri Lanka has spread islandwide to become an organisation which is globally accepted and recognised in 13 diocesan centres and over 200 countries. With over four decades of experience working with communities, today Caritas Sri Lanka has supported thousands of poor and marginalized families and especially those affected by man made and natural disasters irrespective of caste, creed, gender or ethnicity. Caritas Sri Lanka will celebrate its 40th Anniversary with a trade fair which will be held at National Level on 2nd - 3rd December 2008 at Vihara Maha Devi Park. Trade Fairs are an important part of Caritas Sri Lanka - SEDEC's process of empowering people to rebuild their lives after many natural and man made disasters. These Trade Fairs provide an opportunity for self-help groups or Animation groups to promote their livelihood, exhibit their products and thereby venture into new business avenues and link with potential buyers. Many trade fairs were also held throughout the country in the 13 Diocesan Centres of Caritas Sri Lanka - SEDEC. An inter religious celebration will also be held on December 4. Caritas Sri Lanka will continue to work for the poor and marginalised in the years to come focussing on integral human development, building sustainable peace and disaster response and community based disaster preparedness programmes. The Buddhist and Catholic community at Buttala joined hands on November 10 to commemorate the 21st death anniversary of the "il-masa weeraya"- the "November Hero" of their life, Rev. Fr. Michael Paul Rodrigo OMI, who was assassinated in 1987 at the "Buttala Subaseth Gedera" while Fr. Mike was offering Holy Mass. In his address Fr. Mike had told the people the meaning of the "Breaking of Bred" was that we should be prepared to lay down our life for others". The Holy Mass was offered by His Lordship Rt. Rev. Dr. Winston Fernando SSS Bishop of Badulla along with Very Rev. Fr. Clement Waidyasekera OMI, Provincial of the Oblates of Colombo Province and Rev. Fr. Augustine Fernando, one time a colleague of late Fr. Michael Rodrigo. Ven. Walaharuwe Sirisumana Thera present at the Service. Subaseth Gedera Director Rev. Fr. Roshan Silva OMI organised the Memorial Holy Mass. A group of Buddhist elders and children assisted preparing the alms-giving and attended the Buddhist memorial ceremony held in the evening at the burial ground located at the Subaseth Gedera premises. St. Vincent de Paul Church, Karambe was Blessed by His Lordship Most Rev. Dr. Valence Mendis, Bishop of Chilaw on October 19 with His Grace Arch Bishop Emeritus of Colombo Nicholas Marcus Fernando, and His Lordship Bishop Emeritus Chilaw Frank Marcus Fernando, with the participation of several priests and nuns. A massive crowd was present in spite of the heavy rain. The St. Vincent de Paul Society, established in Sri Lanka in 1904, with the foremost objective of serving the poor, working through 294 conferences spread throughout the island, has rendered an invaluable and recognised service to the poor irrespective of race or religion. Although the organisation celebrated the Centenary Jubilee of its existence and services in Sri Lanka somehow not a single church had been built in honour of St. Vincent de Paul, the patron Saint of the society and of the poor. When the Vincentians of Nagoda, Kandana became aware of this fact in early 2004, they were determined to build the 1st church in Sri Lanka, inspired by the words Fr. Patrick Peyton once said "Tis better to light one small candle than curse the darkness". A search to find a community of poor Catholics in need of a church and with no means to build one, commenced. On being informed by Rev. Fr. Sunil Wijesinghe, administrator of St. Anne's Shrine Thalawila, that the people of Karambe, had a land but no means to build a church. We visited Karambe on February 2, with Rev. Fr. Wyman Cross, the Parish Priest of Mampuri, and met the villagers and expressed our intention of finding a place to build the 01st church in honour of St. Vincent de Paul in Sri Lanka, and our willingness to build and gift a beautiful church for them, if they agree to it. They were agreeable to our suggestion. It was a formidable task for a small conference as Nagoda. But trusting in the Good Lord we took up the challenge, for nothing is impossible if the Lord is with you. Foundation stones were laid by Rev. Fr. Sunil Wijesinghe, Rev. Fr. Preeya Jayamanne, and Rev. Fr. Wyman Croos on the 16th August 2005. Members of Nagoda S. V. P. conference worked tirelessly to raise funds for it. Work progressed as funds were received. The total cost at completion was Rs. 70 Lakhs approximately. This project is unique for more reasons than one: This church is a gift from a small Society in the Archdiocese of Colombo to a community of Catholics in need of a church in the Diocese of Chilaw. Secondly the raising of funds guidance and supervising of it was done by a group of ladies, who had no knowledge or experience in construction work, or on a project of this nature or magnitude and. It is also the 1st Church in honour of St. Vincent de Paul in Sri Lanka. An Eucharistic service of Thanksgiving was concelebrated by His Lordships Bishop Valence Mendis and His Grace Arch Bishop Nicholas Marcus Fernando and His Lordship Bishop Frank Marcus Fernando. The road in front of the church was declared "St. Vincent de Paul Mawatha" by His Lordship Bishop Frank Marcus Fernando.